Not everything is as it seems. A post on sketchy identities, confusion, possibly even deception. It introduces a relatively unknown British jazz artist named Scott. Not Tony, not Ronnie, but…Johnny. And even that’s not his real name. Follow the twists and turns in another jazz mystery tour. Buckle up and hold tight! Johnny Scott, flute; Barry Morgan, drums ; David Snell, harp; Duncan Lamont, saxophone; recorded probably at Lansdowne Studios, Holland Park, or some other studios, somewhere in London, by someone not mentioned in the credits. 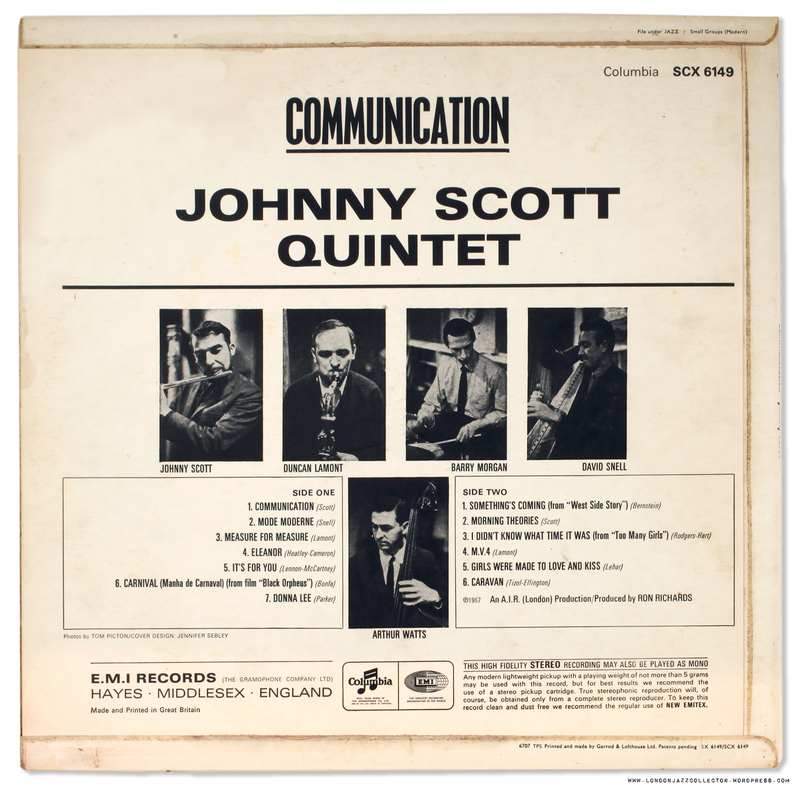 Johnny Scott led a jazz quintet, quartet and trio during the 1960s, but he was better known as a composer of music for TV and film, from the ’60s throught to the present day. He has hundreds of soundtracks to his credit including a good number of schlock-horror movies as well as big motion pictures, such as Anthony and Cleopatra (1972) starring Charlton Heston, real name, John Carter. Among Scott’s many film scores was one for the 1920 silent movie, Dr Jekyll and Mister Hyde, one man with two identities. Faced by four red flags: “British Jazz”, “flute”, “harp”, and songs from “Hollywood musicals”, I still don’t know why I went for this album. Probably just contrariness, challenge your assumptions. Without going the full Harry Potter, it revealed, unexpectedly, a box of treasures. Interesting how shaky knowledge is revealed, when you know something about a subject personally – a warning to anyone who believes anything written in newspapers. Grant Green first put Lazy Afternoon to disc on Street of Dreams (BLP 4253) which was released by Liberty in 1967. However, a working knowledge of the allocation of Blue Note catalogue numbers should have immediately raised a red flag to John Sheldon over the alleged “1967” date of 4253. BLP 4253 was in fact recorded three years previously, in 1964, released deferred by Blue Note and expedited by Liberty Records in its second year as Blue Note catalogue owner in 1967. Two years before Liberty released the Grant Green recording, drummer Pete LaRoca put Lazy Afternoon on his debut LP Basra (BLP 4205), recorded in 1965 with Joe Henderson/ Steve Swallow/ Steve Kuhn. None of which helps to explain how Van Morrison allegedly came to write Moondance in Cambridge, Massachusetts somewhere around 1968-9, when David Snell’s Mode Moderne was written, recorded and published a continent away by the Johnny Scott Quintet, a year before, in 1967. It’s a mystery (scratches head, nostrils quiver). Reflecting on the lyrics, I suspect a “moon-dance” has nothing to do with astronomy or dancing. More likely it is a thinly-veiled sexual innuendo, but who knows, anything goes in the world of pop. UK pressing of Columbia Magic Notes issue by EMI, Hayes, Middlesex. Social Justice Alert! Middlesex has no trans-gender overtones. It is merely a UK postal address county which has long since ceased to exist except on letterheads and old record jackets. Columbia Magic Notes showcases a number of magical recording of British Jazz in the latter half of the ’60s, when British jazz veered sharply away from impersonating American Jazz. Columbia had licensed use of the Columbia “Magic Notes” trademark in the UK to EMI, as seen on the label below. Despite the word Columbia on the label, is not a Columbia record. To get around its own EMI licensing problem, Columbia actually released Columbia recordings in the UK on the Philips-owned Fontana label, until eventually it set up CBS in Europe. So this Columbia is not that Columbia. This is EMI. None of the players were known to me before, my ignorance is no excuse. John Scott is currently artistic director of the Hollywood Symphony Orchestra. Tenor player Duncan Lamont is still playing and composing. Harpist composer and conductor David Snell is still composing and producing film scores – recent scores include the soundtrack of Marvel franchise Deadpool (2016) though I couldn’t hear any harp among the special effects boom bash and biff. Barry Morgan and Arthur Watts careers remain unknown. 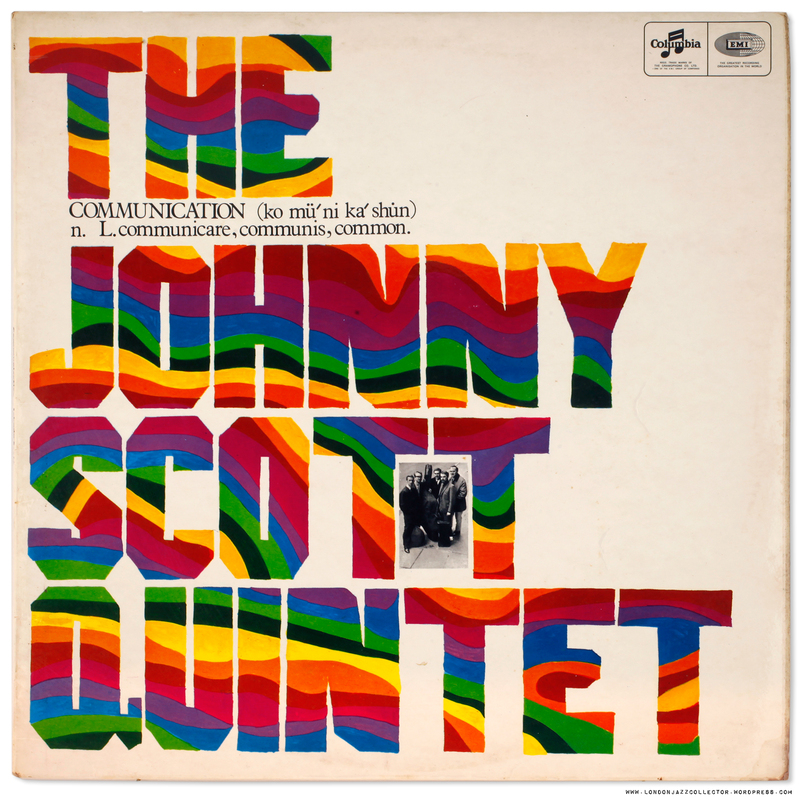 This album is rare but not inordinately expensive, as a result of the Johnny Scott Quintet being relatively unknown. Own up, Johnny Scott Quintet likely wasn’t known to anyone. (Except possibly Van Morrison?). At this juncture I need to reveal “Johnny Scott” is not his real name. It is Patrick John O’Hara Scott, the Johnny invented to sound more jazzy. Patrick is an Irish name, which at least gives him another thing in common (in addition to “Moondance“) with Van Morrison, who is also Irish, and who also altered his name, which was originally George Ivan Morrison. Two perfectly good names, Patrick (Patron Saint of Ireland) and George (Patron Saint of England) unceremoniously dumped following the fickle pied piper of fame. Sources tell me that another track from Communication is a favourite of a Jazz DJ, Gilles Petersen, (apparently also not his real name, which is Gilles Moehrle) -It is Johnny Scott’s conga-tastic version of Duke Ellington’s Caravan. Duke Ellington was not actually a Duke, which is one notch below the King in a monarchy hierarchy. “Duke” Ellington was a mere commoner, Edward Ellington. More than 350 versions of Caravan have been recorded since its debut in 1936, written by Ellington and Puerto Rican trombonist Juan Tizol, a member of Duke Ellington’s band credited as co-writer of “Caravan”. As far as we know. Or we think we know. Conga-tastic indeed! 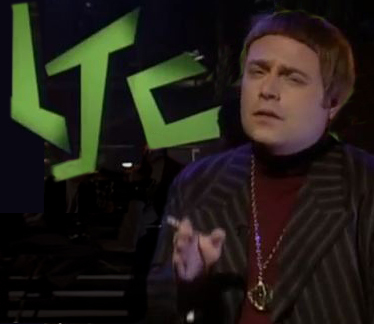 says LJC – which as you know is pure invention. I am a fake DJ, using the picture of another fake DJ from an old BBC comedy sketch show, a character partly based on two other TV comedy fake DJs, Smashy and Nicey, and partly based on the BBC Old Grey Whistle Test presenter “Whispering” Bob Harris, real name Robert Harris, virtually the only real one so far in this story. This entry was posted in British Jazz, Columbia, EMI Lansdowne and tagged DJ Gilles Petersen, Mistaken Identities, Moondance by LondonJazzCollector. Bookmark the permalink. Duncan Lamont is probably most famously heard as the sax player on Dusty Springfields ‘Lookof Love’. Ah Dusty Springfield, the singing eye-shadow and beehive, (terribly disrespectful at the time, we used to call her “Rusty Springboard”). 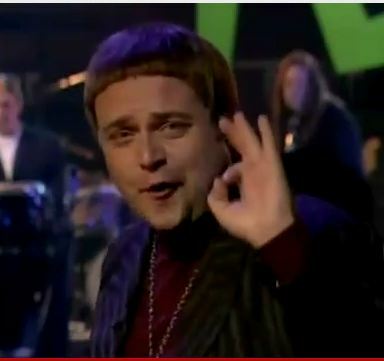 I certainly remember “The Look of Love”, but to be honest, I’m struggling to remember the sax solo, too young I think. Great that British jazz musicians could earn a decent living doing TV, film, and Tin Pan Alley assignments. They would have starved on the meagre income from jazz record sales. However had they sold more, they wouldn’t be so expensive today! Barry Morgan (1944-2007) is on a ton of releases, mostly library records and things of that nature. I remember seeing Johnny Scott with the Vic Ash Sextet in 1958 and the Tommy Watt Orchestra in 1959 at the Jazz Jamboree concerts at the Kilburn State Gaumont and again with the Woody Herman Anglo American Herd in 1959. He was one of the great flautists of that era. Arthur Watts was another great bass player in that era playing with such groups as Don Rendell Quintet, Vic Ash & Harry Klein Jazz Five, the Ken Moule Seven. OMG, Gaumont State Cinema, Kilburn! Harry, I had forgotten about that venue for forty years, if not longer. Kilburn, as I remember it was then heartland of the Irish community in London. Bejesus! Willesden Green, Dollis Hill, Neasden, wherever next? Last I was in nearby West Hampstead was in 1968 was to see Led Zepplin at an all-seated gig at Klooks Kleek. Seems I was a decade slipstreaming you. Thanks for sharing memories, captured instead of lost, bravo. “ …..it filters a number of a number of jazz standards like….Take Five and Girl From Ipanena through the prism of David Snell’s harp. A former military bandsman, Snell was a busy session musician in classical, pop and library camps in the 60s and 70s, and it is fitting that he not only ended up as a respected classical composer but also found time to play harp on sessions for Trevor Horn’s kitchen sink production of Grace Jones’ Slave To The Rhythm 1985”. I’ve never heard it, but I thought it might be of interest to completists and British Jazz collectors everywhere. Kenny Wheeler always used Duncan Lamont on his big band recordings which is recommendation enough. Playing with KW a few years he was the most impresssive soloist in a stellar line up inc Parker,Warleigh,Lowther,Taylor et al. i finally a copy of this about six months ago from the UK via discogs after years of searching here in the states. i ADORE this record, and i’m glad you’ve gotten yourself one. also, you’ve left off the poor arthur watts (bass) in your personnel listing! Interesting and informative comments ,thanks. A very good album.There is another excellent Johnny Scott Quintet album called “Purcell Variations for Five” on Fontana. BBC broadcast some old episodes of Jazz 624 some years back as part of ‘British Jazz Night” and the quintet appeared playing several selections from both albums. Scott also appeared on flute on the programme with Bill Le Sages Directions in Jazz Unit.He also played on the album of that name.Very good musician,composer and arranger. Another late sixties British jazz album worth watching out for – Off Centre : The John Cameron Quartet – some fine McNair flute, includes the funky track – Troublemaker.